To get an indication of the correct "strength" for your eyesight, you may download our free eye chart below. This should be printed out, rather than viewed on screen as the size of lettering can vary between computers. When printing, ensure there are no settings that may enlarge or reduce the chart to fit on the printed page. The free Adobe® Reader® software is required to view the eye chart. Our reading glasses and sun readers are available in multiple "strengths" (officially known as the "diopter" rating, which is a unit of measurement of optical power). Strength is specified on a scale of 1.0 (which provides the least amount of optical power) through to 3.5 (which provides the greatest amount of optical power for weaker eyes). 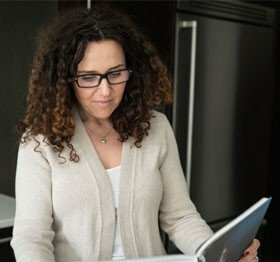 When you buy online from The Reading Glasses Company, you may easily select your required strength by means of a drop-down menu before clicking the "Add to Basket" button. Note: Your eye sight is important, and our free eye chart should not be considered a substitute for regular eye tests at your opticians.